This leather wristlet is ready to give your phone a boost as well as your wardrobe. When you're out and about, it can power your phone with its handy, hidden charger. Mighty Purse will recharge your smartphone twice on one charge of its own. 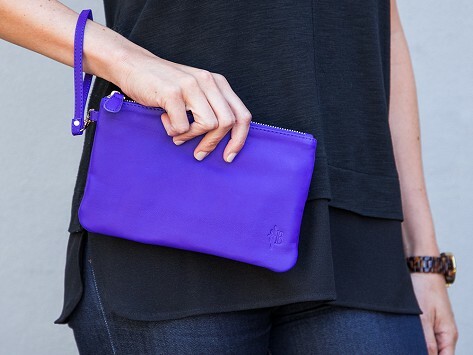 Inside, credit card slots and a zippered pocket can hold other everyday essentials. Dimensions: 5.9" x 9" x 0.39"
and it really does charge my phone all the way up twice! the charger can be used separately. Its wonderful! I asked for and received mine for a Christmas gift. I love it!!!!! First, it looks very stylish and all the gals at work agreed when they sawey saw it. I have mine charged and ready to go. I was told it holds the charge for a year each time I charge it. I regularly charge my phone but when I had to leave for work during a snowstorm ,I grabbed my ready to go mighty purse knowing if we lost electricity I would be good to go for two more charges. I reached for it again , during a family emergency knowing I would be good to go for a long time. The ultimate fusion of style and technology, the Mighty Purse is one powerful fashion statement.